1월 30일에는 브롱스 이스터실즈의 특수교육이 필요한 아이들을 찾아가 함께 춤추고 노래하며 즐거운 시간을 보내고 왔습니다. 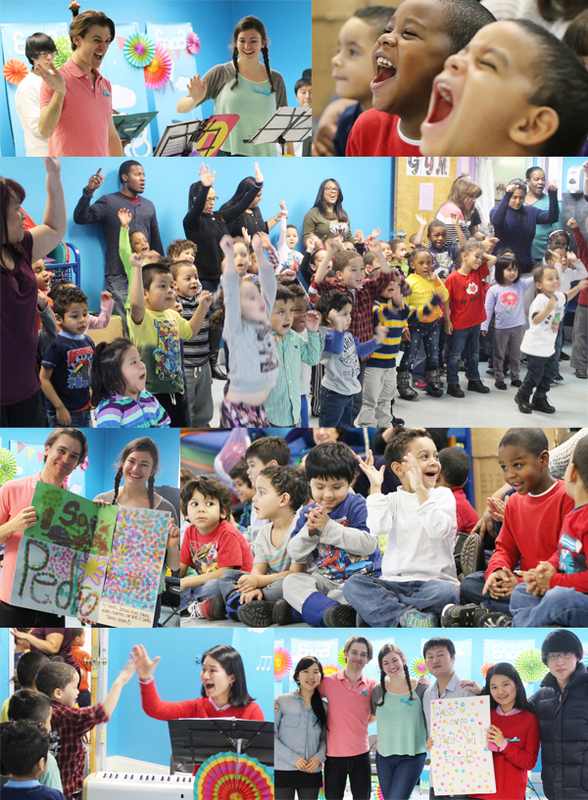 On January 30th, EnoB held a outreach concert in the Bronx for children with special needs. The program had the children dancing and singing all together. We all had a great time! 1 월 9일, 사우스앰보이의 은혜가든 양로원의 어르신들을 위한 아웃리치 콘서트를 개최하였습니다. 어르신들을 위한 한국의 가곡, 동요를 준비하여 함께 부르는 시간을 가져 큰 호응을 얻었습니다. 또한 이번 공연을 후원하신 조 파운데이션의 조용근 선생님께서 특별공연으로 그네와 눈내리는 밤을 열창하여 더욱 뜻 깊은 공연이 되었습니다. 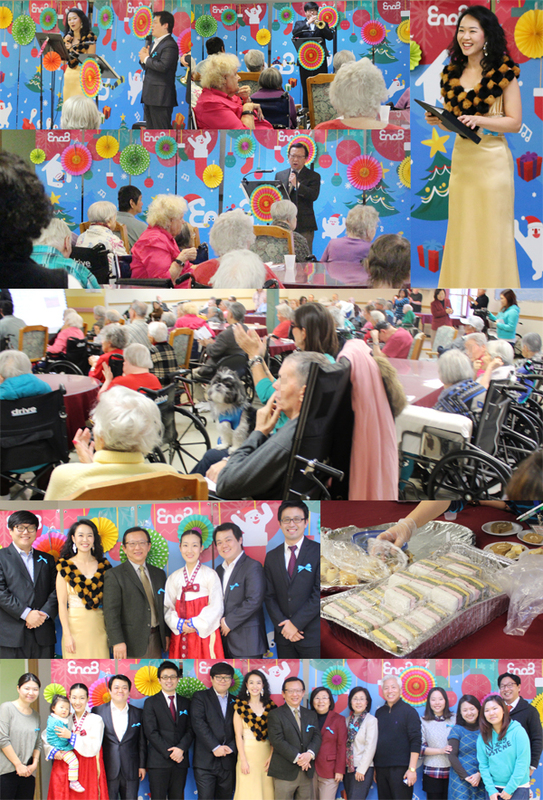 On January 9th, EnoB held an Outreach Concert for the Elderly at Briarwood Care & Rehabilitation Center . 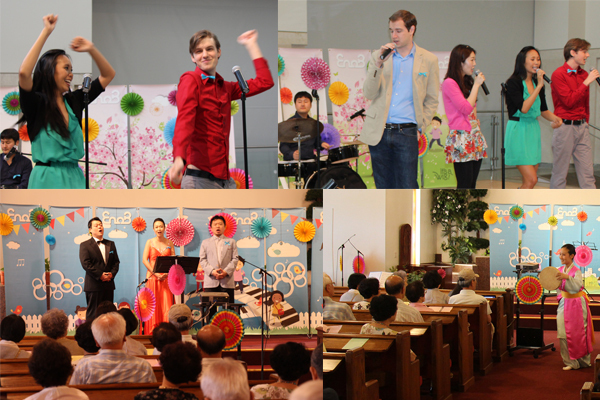 Musicians performed Korean songs and children's songs . This concert was enjoyed by all. Yong Keun Joh, who sponsored this concert, sang ‘Swing’ and ‘The Snowy Night’. His participation made this concert more meaningful. This concert was sponsored by Joh Foundation. 이노비 뉴욕이 YTN의 '글로벌 코리안' 프로그램을 통해 2013년 12월 21일에 소개되었습니다. "음악으로 이웃과 하나되는 따뜻한 연말"
YTN captured on film an Enob's concert that took place in a local New York neighborhood. 그 동안 이노비에서 부 사무총장으로 근무하던 김재연 선생님께서 올해부터 사무총장을 맡아 일하시게 되었습니다. 김재연 신임 사무총장은 2011년 이노비에서 마케팅 디렉터로 일하시기 시작한 후 2년 반의 시간 동안 부 사무총장을 거쳐 두루 이노비 뉴욕의 업무를 총괄하셨습니다. 많은 격려와 성원 부탁 드립니다. 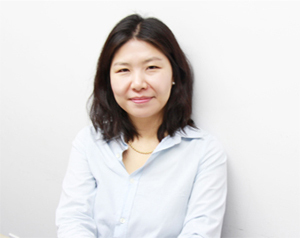 Starting January 2014, Jae Yeon Kim has become Executive Director of EnoB, NY. 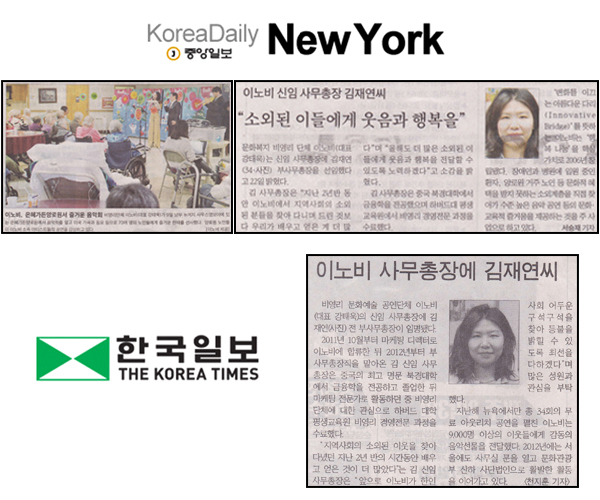 Ms. Kim's previous positions have been as the Marketing Director and as the Associate Executive Director of EnoB NY from 2011 to 2013. 김혜진 매니저님은 지인을 통해 저희 이노비를 알게 되었고 미디어를 통해 소개된 이노비의 활동과 비전을 보고 깊이 공감하여, 도움이 되고 싶어 정식 스탭으로 참여하게 되었습니다. 소외된 이웃들과 병원에서 일상을 보내고 있는 환우와 그 가족들에게 작은 사랑이라도 나누어 행복이 전해지는 일에 뜻을 같이 하기로 하였습니다. 앞으로 이노비 서울의 업무를 맡아주실 김혜진 선생님께 많은 응원 보내주세요! 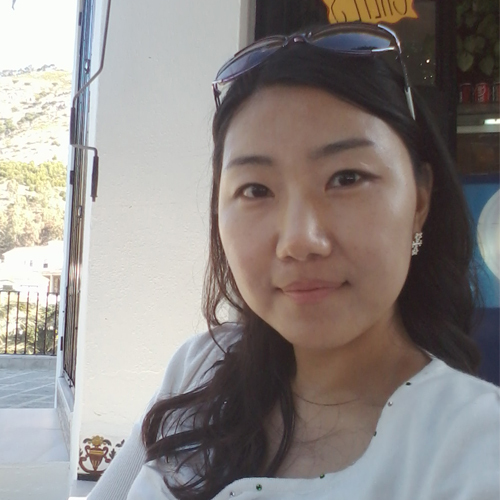 Hye Jin Kim is the new manager of EnoB Seoul. She heard about EnoB through an acquaintance, and was impressed by EnoB’s activities and vision. She wanted to become involved with the organization and ultimately, was hired to manage the Seoul branch. Please welcome her to EnoB Seoul. 이번학기 봉사자는 이화여대 수학과 4학년에 재학중인 학생으로, 겨울학기 '사회봉사' 수업을 통해 이노비와 만나게 되었습니다. 뮤지컬을 좋아해 동아리 활동을 하면서 관심을 가져 왔는데, 음악을 통해 봉사하는 이노비를 보고 이번 학기 봉사를 결심하셨다고 합니다. 형지님은 아웃리치 콘서트 준비와 동영상 편집 등을 함께 하며 보람있는 방학을 이노비와 함께 보내고 있습니다. 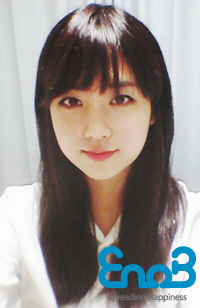 Kim is a student at Ehwa Women’s University in Seoul. She came to EnoB through the winter class ‘ Community Service’. She was so impressed with EnoB's outreach musical programs that she decided to volunteer at EnoB. She spent her winter vacation preparing outreach concerts and editing videos for EnoB. 이노비의 든든한 후원자이신 제이슨 전(전지웅) 이사장님과의 인터뷰 입니다. 이노비: 이사장님은 기부와 봉사활동을 많이 하시는 걸로 알려져 있습니다. 어떤 활동을 하시는지 소개 부탁 드리고, 이노비를 도와주시기 시작한 계기와 화목하신 가족분들 소개 부탁드립니다. 제 아내는 물리 치료사인데 결혼 후 NYU Medical Center 에서 일했습니다. 새벽에 일찍 버스를 타고 Manhattan 에 출근 하는 것이 안타까워 차로 출근을 시켜줬는데 잠시 한다는 것이 근무하는 3 년 동안 매일 데려다 줬습니다. 그때부터 지금까지 항상 붙어 있는 것 같습니다. (웃음) 큰 아들 Michael은 미시간 대학교 1학년에 재학 중 이고요 둘째 Timothy 는 Horace Mann 에서 Junior 입니다. 항상 이노비를 격려해주시고 소중한 인터뷰 시간을 내주신 이사장님께 진심으로 감사드립니다. What made you start volunteering and making contributions? I realized that my involvement was as important as the money; I can be more helpful to people. I am trying to invest even more time and effort in order to contribute to the community. You are a great supporter to EnoB. What is your motivation to support our organization? Music is generally a good tool to make people recover from tiredness and stress. Especially for someone who is mentally or physically challenged, music is uplifting and a huge source of hope and pleasure. When I first had a chance to watch an EnoB concert, I saw the audience’s pleasure and happiness immediately. At that moment, I realized that what EnoB does for people is very important. Please introduce your family to us. My wife is a physical therapist. She worked at NYU medical center just after we got married. At the time, I felt really sorry for her taking the bus every morning to work, so, instead, I gave her ride every morning. Despite my first intention of doing it for a while, I did it for 3 three years! We have been very close ever since. Our eldest son Michael is a freshman at the University of Michigan. 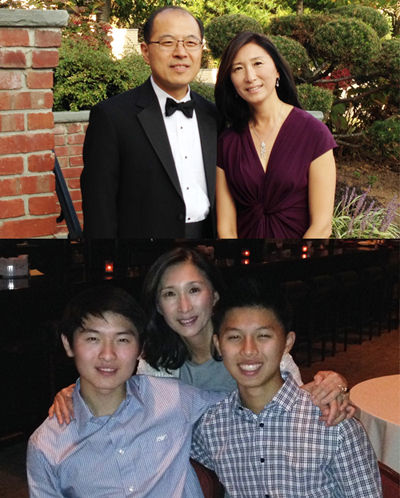 Our second son Timothy is a junior in high school at the Horace Mann School. 뉴 욕 파슨스디자인스쿨의 한인학생회 KAP(Korean Association of Parsons)를 소개합니다. 2013년 9월부터 이노비와 협력관계를 맺은 KAP는 이노비 베네핏 콘서트의 특별전시회에 작품을 출품하였으며, 또한 작품판매 수익금을 이노비의 활동을 위해 기부를 하기도 했습니다. Since September 2013, EnoB and Parsons KAP(Korean Association of Parsons) became a cooperative partners. KAP displayed their art work during EnoB’s Benefit Concert in a special exhibition. KAP donated the profits from selling the works to EnoB. 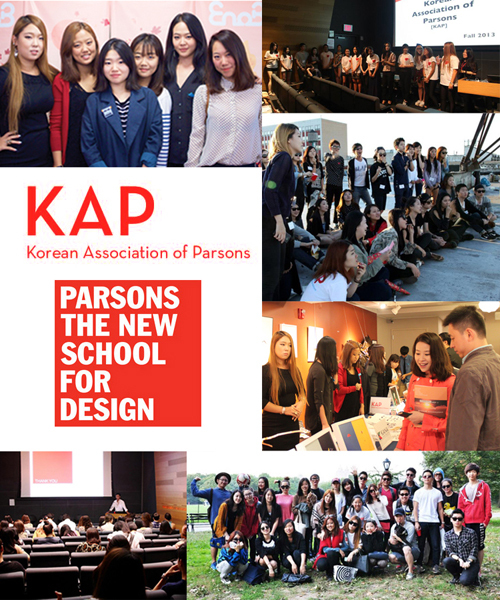 KAP is a Association of Koreans students attending Parsons. The students do a great deal of networking between NY and Seoul. 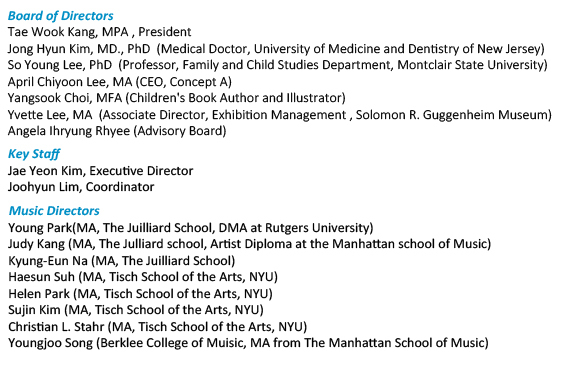 They connect students with many design organizations in NY. They also offer opportunities and information about employment in the design field. 이노비 서울, 숙명여대와 협력관계 체결! 이노비가 숙명여대 음악대학과 협력관계를 맺어, 앞으로 이노비의 소외계층을 찾아가는 음악회에 숙대 음대 학생들이 재능기부로 참여하게 될 예정입니다. 학생들에게는 재능기부와 비영리단체의 현장 경험을 교육하는 기회가 되고, 또 우리 주변의 문화적으로 소외된 분들께는 더 많은 음악 공연을 선사할 수 있는 기회가 될 것입니다.이노비는 더 많은 학교와 앞으로 파트너쉽을 체결하여 함께 좋은 시너지효과를 낼 수 있도록 노력할 예정입니다. 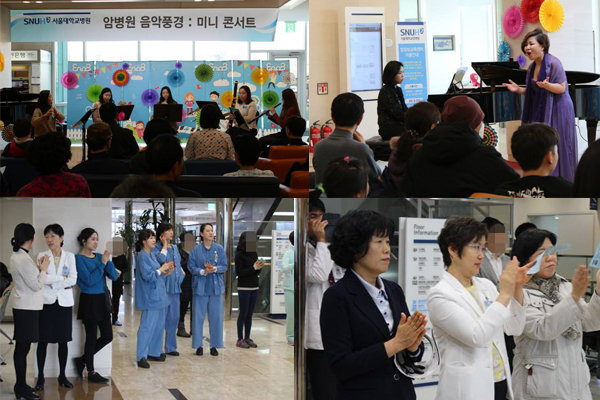 Sookmyung Women's Music University and EnoB have created a partnership. This partnership, with the talented musical students of the University, will benefit a group of underprivileged people . For the participating student, it will be an opportunity for them to use their talent to benefit the underpriviledged. They will also learn how nonprofit associations operate and begin to understand what a huge contribution they are to people who feel left out of society. 2014년 1월 15일, EnoB Seoul 신년콘서트를 서울대암병원에서 메조소프라노 정유진 선생님과 목관5중주 소누스가 함께 했습니다. 병원 로비에 가득 메워주신 환자와 가족들 그리고 병원 직원분들과 음악회의 큰 감동을 함께 느꼈습니다. 음악으로 1월의 추운 겨울날씨가 따뜻하게 녹았던 하루였습니다. On January 15th, EnoB Seoul held an New Year Concert at Seoul National Univ. Hospital. 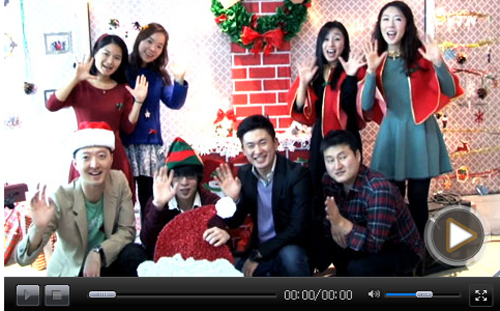 The Concert was performed by Eujin Jung and SONUS. This concert was enjoyed by all. 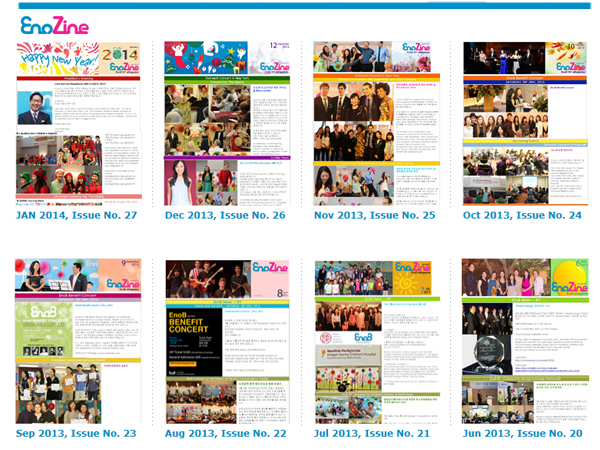 Over the last seven years, EnoB has spread happiness to 7,000 program participants, and that number continues to grow! The musicians, artists, staff, and board members at EnoB could not accomplish their mission without the support of our donors and volunteers.